I don't know about you, even I don't how did you find this article(SEO WORDS), but I do know one thing, after reading this article, you will get great value from this, because I am going to share with you great tips for Search Engine Optimization for blog, as a blogger it is little bit difficult to hire a SEO agency for optimizing your blog for search engines, so there is one very good option that is learn it, it is not tough just you have to give time to learn it, but of course you will become very good search engine optimizer, this is my guarantee to you. Now come to the point, let me tell you something about search engine optimization, probably you have some misunderstanding about SEO, actually many SEO agencies and also many bloggers said that Search Engine Optimization can get you first rank on Google, this is not like this at all. Search Engine Optimization is only help search engines crawlers or spiders to read your blog or website properly, that's it, there is nothing special about this, probably you know search engine like Google, Yahoo, Bing they don't show rank on search results because of money, those results are automatic, there are about 200 things on which basis search engine like Google shows results for a query. Quality means how you are providing contents to your readers, because if you are providing quality content then people do more activity with your content, those activities like sharing, more time spending on the page, search engine want only quality content from bloggers, but every blogger don't provide quality contents that's why they never succeed in blogging, because blogging need continuous improvement and also quality content then only people will come to your blog again and again. Remember real business having returning visitors, blogging is a real business, if you want to do real business then you have to write your content in that way that's why a visitors will come your blog once, the visitor will come to your blog again and again because you are providing quality content and also unique, do more experiments in blogging to share real experience of blogging, start writing blog post with providing subheadings and don't forget to read the blog post properly after writing it! Research is needed every where to make it more useful for people, of course we do research to help people in this way we make money, blogging is the same, we do research and write blog post people get help from the post, in this way we make money from advertising networks, affiliate programs. Blogger must be a good researcher and more important blogger should provide useful contents to readers, what search engine likes and there is one big way to get useful contents that is research! Words, this is big in SEO because the whole SEO shows results on words, so write article title exactly what people are searching on the web, then you will get more visitors to your blog, because search engine first fetch title then look content, tags, reputation, page rank, URL structure. But the first thing is title, so always concentrate on title, before going to write any blog post. Now come to the next thing "words", remember search engine shows results on article content too, so always write an article by using words you have used in your title, if you want more visitors from search engines. Engagement of your blog post is also important in blogging to get good rank on search results, now may be you are thinking what kind of engagements? Actually there are two board terms, one is anchor text and another one is social engagements. Lets help people to do it quiet easily by adding easy social sharing button but you must use anchor text in your blog post to engage users in your blog and make users to stay long time for providing better content and also better engagements. What type of article you are writing in your blog also matter in ranking, if you are writing most recent demand content in your blog post, then search engine crawlers, index your page quiet recently, because there are only few articles over there on the recent trends, if possible I will suggest you to write recent means trending topics and also write evergreen article, that's why if you will an article once, you will get benefit of writing the article for forever. Meta's are always work for search engines, after all it tells to the search engines about the blog content in the short form. So, always provide meta description of your blog for better ranking of your blog on search engines, actually I have written an article, how can you do this. After writing meta description, add meta keywords to your blog, that's why search engine crawler will understand category of your blog quiet easily. It will help search engines to understand the category of the blog, now may be you are thinking, how can you do it? read the recommended post to do it(step by step guide). Categories are most important in blogging too, because if you want to become a professional blogger, that means blogging is only your job, then you have to choose only few topics and you have to provide quality content on those topics only, this is the only very good effective way to become a professional blogger. Speed means loading time of your blog, because if you want to create a user friendly blog then you should have to use less gadgets or plugins that's why your blog load faster, this is also effect in ranking of your blog. So, make your blog light, don't use unnecessary photos on your blog home page, use only necessary plugins that's why users can easily browse your blog, if the user having slow internet connection even. URL means Universal Resource Locator, but you have to learn some thing different from it, that's why you can optimize your blog for search engine, I am talking about URL structure of your blog post, this is also matter to get good rank in search engines. Time spending your blog reader on your blog is also matter for making good reputation of your blog, because whenever you see Google Aanalytics they show users spending time on your blog per visit, per page, even Alexa also show this, this is most important in blogging that write fully define article that's why if your reader will read your one blog post, he or she will read another couple of post in a single visit, then you will make the visitor your life time customer, so while creating a blog post do give your full concentration to write a good article. In SEO there are two most important factors those are on page factors and also off page factors, in link there are two types of link one is link on your page to your on own blog post, that is called anchor text in technical language, I have already said this. In this section, I will tell you, what is off page link? Why is it important? In SEO, if your getting links to your blog or blog post that is called off page link, off page link is important because you will get links from other websites or blogs, if and if you are providing quality content on your blog then only. Now the questions is that, how would get these links(Back Links) for free in the beginning time of blogging, there is an effective method to get it, that is by commenting. May be you have seen on Google that you can block results of any blog or website, if that blog is not providing quality content, now come to the concept how Google take over this, actually when a user block any website or blog then the reputation of blog or website get's down. So don't provide any thing on your blog that's why your users will not like to read another post of your blog(finally block results of your blog), keep this thing in your mind every time to become a better blogger. Comments are almost everything in blogging, first which encourage bloggers to keep blogging with improving quality of contents, but if you are not getting any comment on your blog, then what you have to do? Improve your writing quality, use subheadings in between the blog post, write the best thing you know. See comments also play important role to get good rank on search engines, it's shows reputation of your blog post. In search engine optimizations there are two rank we consider, one is very recent that is author ranks and another one is page rank. If you want good rank then you have to provide quality articles, this is the best way to get it, but Google Page rank also depend on domain age, number of posts. 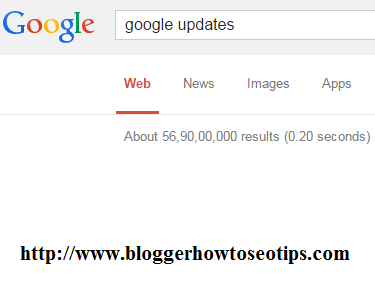 YES, Google updates is one of the most popular topic in the internet world among internet marketer's, bloggers, webmaster's. That's why I think, Google shows high volume result for a searching this result, the screen is given on above. Okay, if you don't have time to do all these or even you need professional then Hire a SEO Agency for doing these jobs for you. The importance of Google Updates, I hope you aware about it, here is the complete guide to recover traffic from Google Updates. Oh it' been from long time you are reading this post, right?, hopefully you got many new things from this blog post. I would like to tell one big thing in SEO that is content, provide quality content and just used simple SEO tips for blog, don't use any tricky tips, it will may banned from Google Search Results. Take care of your readers, always reply to comments! Is there important words in SEO? Quality is most important and better the quality of your website. More the chance of good ranking for that on search engine. Write engage quality content after research is right way to put article on your website.